My mother in law says that I cook more Mexican food than she does in Mexico, and that is probably true, considering that at her late 80's she rather but a pizza or a hot dog than having to cook. In any event, it is true: I love Mexican food as much as I love Italian food, and French food, and Argentinian food, and... you get the idea. I like to cook and I like to eat. In this part of the globe meat is getting quite expensive, so when I see a special on meat, I just go and buy it, otherwise I cook something else. Just last week my local and favorite supermarket (it is called Fresh Street Market...and they don't pay me to say so) they had flank on special (from mega expensive to super expensive) and I bough some to cook it and make shredded beef tacos, one of the current wife's favorites. As I am a pleaser, I cooked for her that fantastic and flavorful dish. When the meat is ready, the smell on its own is so delicious that the house feels so...warm. I love it. My ceiling is OK, my life is not in danger (from cooking mot from the current wife's evil intentions) and... the tacos just disappear. Try the recipe... the family will claim to love you more... it is as good as it is going to get. Go for it! 1. We are going to use our pressure cooker (I have a Fagor, which I really like…but any will do), so we are going to put the beef (I don’t trim the fat as I believe it gives flavor to the meat), the onion, carrots (skin on), garlic clove, potato (skin on), bay leaf and the beef powder. Now put as much water as needed to cover the meat plus one inch, close the lid as per your pressure cooker instructions. 2. Put your pressure cooker over high heat and wait until the pressure is ready, on high setting (on mine is number 2). When starts whistling, then lower the heat to medium high and let it be for 30 minutes. Don’t worry…nowadays modern pressure cookers don’t explode!. The time is counted when the pressure has reached its high level, not before. 3. While the meat is cooking, we are going to prepare the sauce. In a medium size pot, we are going to fry the onion until it gets a bit translucent (not brown!) and then add the stewed tomatoes. Add the beef powder, cover and let it simmer for about 15 minutes at medium-low heat. 4. Transfer the tomato and onion mix to a blender and blend it. 5. Return the blended sauce to the pot, cover and simmer for another 10 minutes. Reserve. 7. Once the beef has cooled down, shred it -while it is still lukewarm, otherwise it will be double the work-. Cut the shredded meat in two or three pieces to make it easy to eat. 8. Combine the shredded beef with the sauce, mix well and on low heat and finish cooking it for another 10 to 15 minutes. If the sauce gets too dry, just add some of the beef stock you got from the pressure cooker. 9. Serve with warm corn tortillas, make some tacos and add to each taco a dollop of heavy cream and some chipotle sauce if you want (I don’t do it as I can’t eat spicy food). * You can use the beef broth for a later use. I also like the carrots and the potatoes because they have tons of flavor. Do a small dish with them. So I saw this book, The lifestyles of the Rich and Famous Cookbook at my local library's book sale and I though it would have a whole chapter about me. I bought it and came home full of expectations. That didn't last long. The book only talks about the "other Rich and Famous" the rich and famous from the 99% is missing. Again. In any event, I like the book quite a bit. Reminds me of the old good times, when Elizabeth Taylor married Larry Fortensky (yes, the construction worker) married at Michael Jackson's Neverland Ranch. Part of the wedding banquet was this Fettuccine with Seafood and Caviar. Obviously they did use Beluga Caviar but I ran out of it (actually I ran out of money but that is besides the point). 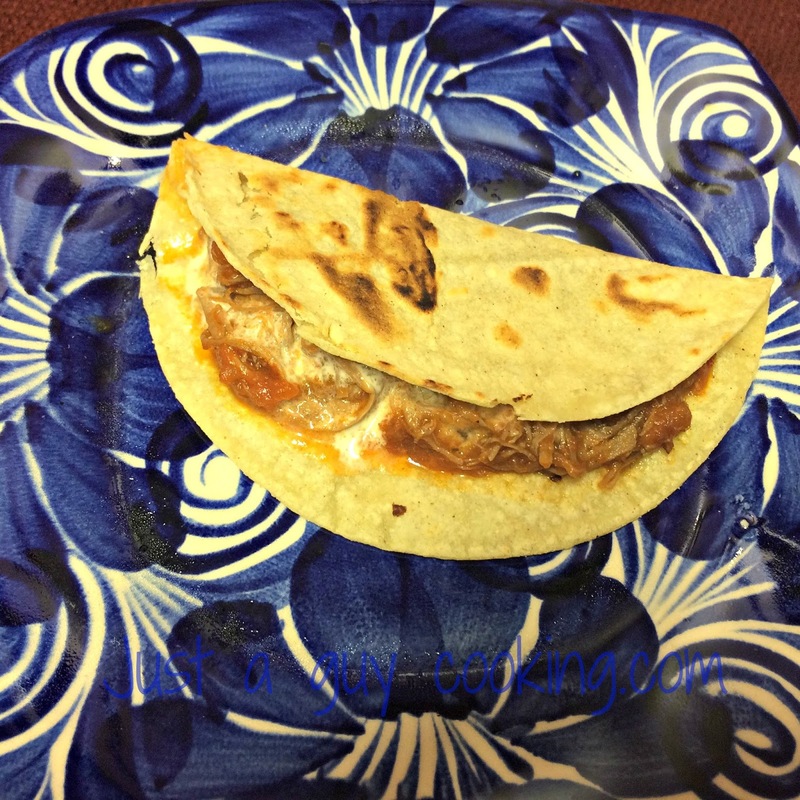 I have to admit: the recipe is quite an easy recipe to cook and the end result is fantastic. The current wife and I enjoyed quite a bit. I proposed to the current wife to recreate Elizabeth Taylor's wedding and having the only son that legally admit I'm kind of his father to take the role of Michael Jackson. She declined because Daniel is not as white as the character called for. I bought for the wife the exact Valentino wedding dress at the Salvation Ary Store but... she refused to wear it. Ungrateful wife I got. The dish is fantastic, tasty and with fresh seafood it can't get better than this. I did use caviar, but a local one, and the end result is really tasty. I wouldn't honestly use Beluga or Petrossian...but if you have money to throw away...go nuts! 1. Melt the butter in a medium skillet over moderately high heat and add the shrimp and toss it until pink (about 2 minutes…tops!). 2. Add the scallops and cook for 1 minute per side. Pour in the cream and partially cover the skillet. Cook for about 3 minutes until the shrimp are a bit firm. 3. 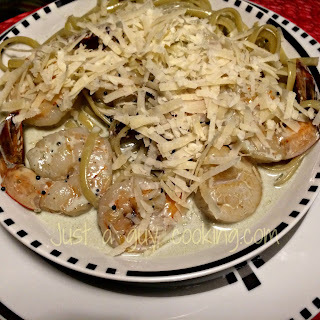 Using a slotted spoon remove the shrimp and the scallops and cover them with foil to keep them warm. Reserve. 4. Reduce the cream over high heat by half and then return the shrimp and the scallops. Reserve. 5. Cook the pasta (follow the manufacturer’s instructions or cook for about 2 minutes if handmade). 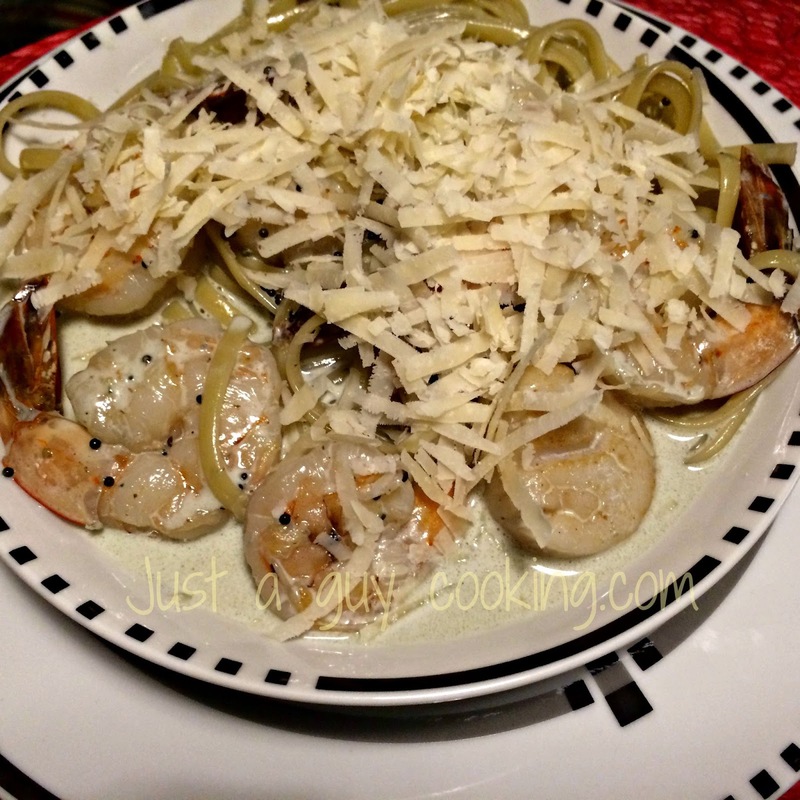 Gently reheat the cream with the scallops and shrimp. 6. Drain the pasta and place it in a pre-warmed mixing bowl. Add the cream sauce and the caviar and toss gently to blend. 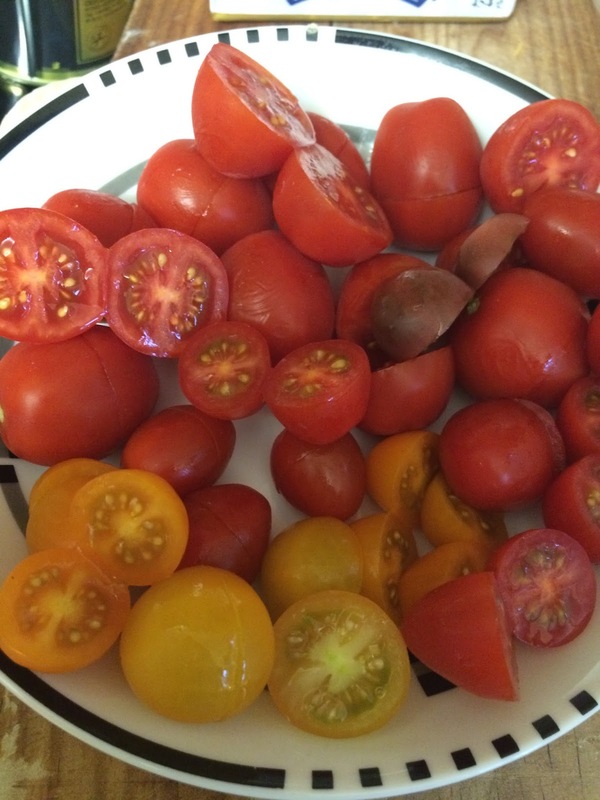 Season if necessary (I don’t think it needs more seasoning…). 7. Serve at once and enjoy! While the current wife was away taking a course on how to I don't remember what (and I do pay attention!) I decided that it was a good time to keep learning how to use my Anova Sous Vide machine. I went to my local supermarket where they sale non local food (...sounds familiar?) and bought fresh Mexican shrimp. I bought the Mexican kind because they were a good size and...on sale. On sale is one of my favorite expressions. As I had purchased a good mezcal in my last trip to Mexico I decided to try this recipe from Emily Farris. As usual I modified the recipe to accommodate to my own taste and to avoid a flare-up (Chron's). The mezcal is an interesting story. Way back then, when I was young, smart and beautiful -last Century- I used to go to have a drink with my University friends or with my super good friend Jaime. Before that actually I never went to a bar ... really... that is the official story and I stand by it. In any event, most of my friends drank Cuba libre (Coke and Rum) and I drank tequila. Back then tequila was a poor man's drink, so I was not well seen in those cantinas. Every time I asked for a tequila they looked at me as if I was asking for charity or something. There were no choices: tequila was one (Cuervo) and it was white. It is important to clarify that I drank tequila because I was cheap...it just happened that I liked it. 35 years later tequila has become a big deal, almost a fad. There are thousands of brands (really!) and the price goes from $15 US a bottle to $500 US a bottle. When I go to a restaurant (the wife does not approve cantinas even though I met her in one...but that is another story) and ask for a tequila... they bring this elegant cart with at least two dozen kinds of tequila... your pocket is the limit. As tequila became so successful, those guys in Oaxaca were about to go to war against Jalisco, who produce most of the world's tequila. In Oaxaca they drink mezcal... and if tequila was a poor man's drink, then mezcal was for those "teporochitos" (drunken men wandering the streets). It was the lowest of the low. But... now mezcal has moved up to the high realms of tequila and there are also hundreds of brands and the prices and quality mimic the tequila's. 2. In a ziplock bag (large size) combine all the ingredients and seal the bag doing the water immersion method and place it in the already heated water bath. 4. When the timer goes off, remove the bag from the water and divide the contents in 4 portions (juice and all). 5. Add 1 Tbsp of Mezcal for each portion at the very end… to give it a kick. 6. 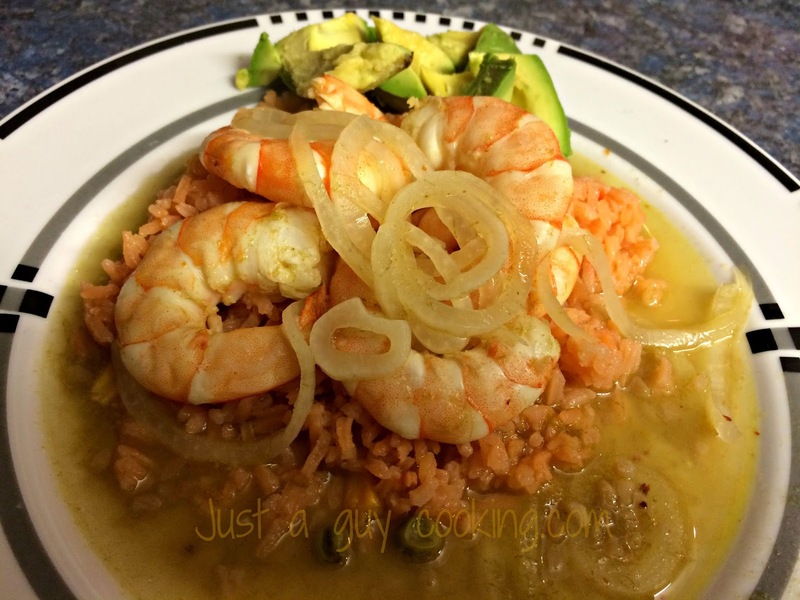 Serve on a rice bed (I did it on a Mexican style rice), add the avocado slices and serve. * If you don’t have Mezcal use Tequila. The main difference is that the Mezcal will give a smoky flavor to the dish whereas tequila won’t. ...and for the so-called cousin of mine who is living in the XII Century... please you try the recipe on a Pressure Cooker. See what happens cheapo! I was watching the other day with the current wife a new Netflix show called Chef's Table and I was watching Massimo Bottura's episode. Watching this episode confirmed two things: one...I can't afford to eat an any of the restaurants featured in the show and... I'm not ready to go full blast to spend what I don't have and eat at any of these restaurants as they are more expensive than training a new wife. Based on that I decided that it was about time to prepare another fresh hand made pasta dish. I do love hand made pasta and I am convinced that there is nothing like it. It is a labor intensive process but with the help of my Cousinart attachment for pasta making and some patience, I just went for it. This time I tried Mario Batali's recipe for the pasta (and please don't tell me that is soooooo easy to make home made pasta and that one doesn't need a recipe because I just don't believe so). It was an egg pasta recipe and yielded enough for two occasions. 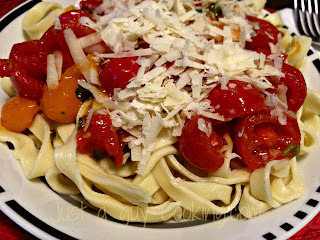 The Cherry Tomato Sauce is from a book I really like called Donna Hay Instant Cook (even though I did the pasta and I still don't qualify as a cook... ). The end result is absolutely fantastic, honest. You should try it even if you go and buy store bough pasta. You will feel that eating this pasta is like watching leaves fall in Autumn. Is that good. Home made pasta is something close to my heart. The woman who claimed to be my mother (remember...no father as I was conceived by an Alien abduction event or something like that). That woman used to slave herself almost all Sundays to have for dinner my favorite aunt (actually my only aunt) and her companion, a super nice guy who worked in TV doing a show with a mouse... for a living -fact-. Those evenings were fantastic. I was sent to the "Club" (a Christian Priest Factory called Vanguardia in the Colonia Roma) while she was the official Chef. Dinner was always an entree, some sort of pasta and... dessert. Dinner was always fun and after dessert I was sent back to the Vanguardia place to watch a two-for-one movie show that included "almost just released" movies like Ben-Hur, The Great Train Robbery -the 1903 one- or Santo vs Las Momias... the Mexican twist to horror movies. I did not became a priest (but it did cross my mind and it was motive of long chats with my mom who saw me as the next Pope), nor a Chef... but I manage to learn how to cook...today Spaghetti with Cherry Tomato Sauce... imagine. 1. In your mixer bowl combine the sifted flour and the eggs and mix it at speed number 2 until combined. You might need 1 tablespoon of water to make it manageable (or two…) . You will get a sticky dough that is ready to be kneaded. 2. Flour a clean surface and start kneading the dough, using primarily your hands. Once the dough is a cohesive mass, set it aside and scrape the work surface so we don’t have any bits of dry dough. 3. Lightly flour the surface and continue kneading for 10 minutes, dusting with flour when necessary. The dough should be elastic and a bit (just a bit) sticky. Wrap the dough in plastic and allow it to rest -room temperature- for 30 minutes. 5. Once the time has passed, start rolling the pasta according to your own pasta maker’s instructions (there are some manual, some electric and some people use the II Century system and do it all the way by hand… your choice). 6. While the pasta is resting, put water to boil in a large bowl. This will be where we cook the actual pasta. Some people like to add salt and some oil to the water… I don’t but it is up to you. Keep the water boiling while we do the sauce. 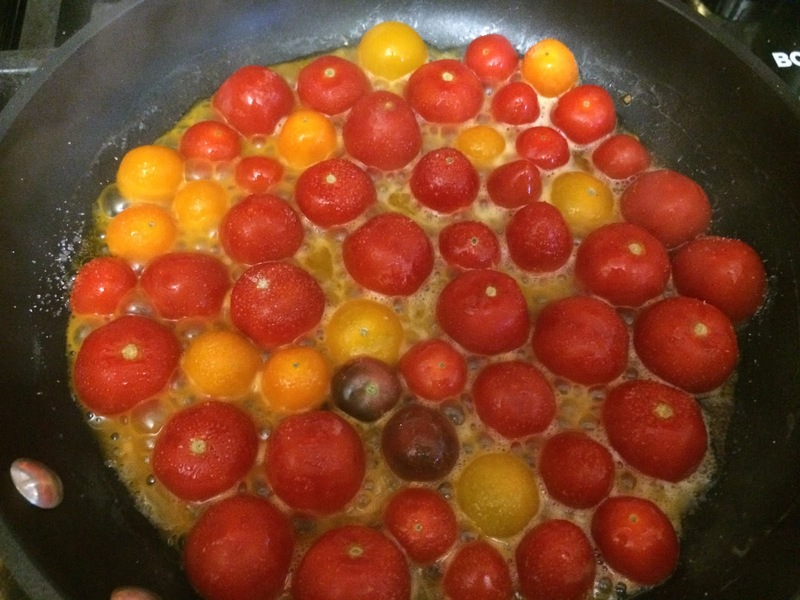 Place a large frying pan over high heat, add the butter and the tomatoes, making sure that the cut side of the tomatoes is the one touching the pan surface. Cook for exactly 4 minutes. Do not add salt!!!!!! 2. Put the pasta to boil. It should take about 5 minutes or less to be ready (home made pasta cooks way faster than store bought). Keep an eye on it so it doesn’t overcook. 3. By now the tomatoes are golden, so you can jus quickly stir for a minute or so and add the olive oil, garlic and the basil. Stir to combine. 2. 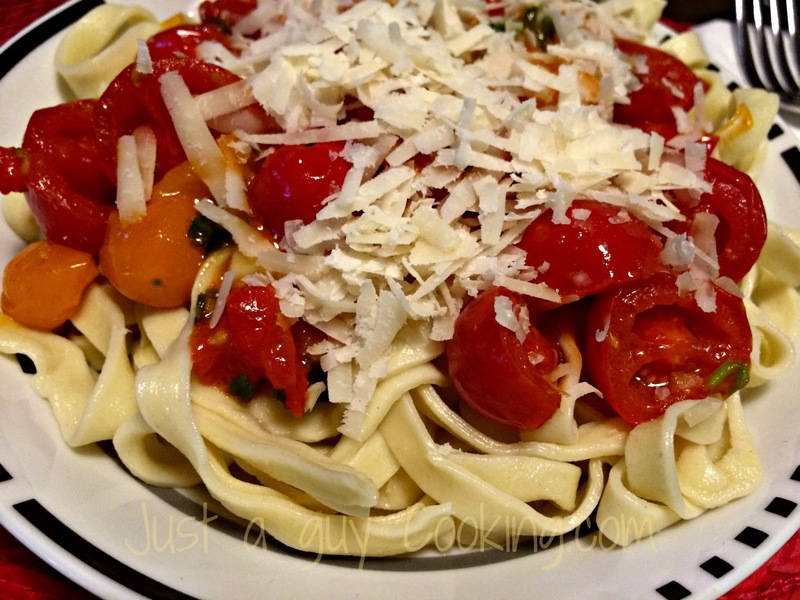 Serve and top with tones of freshly grated Parmesan Cheese. All rights reserved. This site and its contents are protected by Federal Law. . Picture Window theme. Theme images by kcline. Powered by Blogger.